yet just steps from the Old King's Highway—it's a beautiful setting for your wedding ceremony. The Chapel seats 60 people and is available from mid-Spring to December. It's also a perfect location for anniversaries, family reunions, memorial services, blessings, renewals of vows, and other special events. 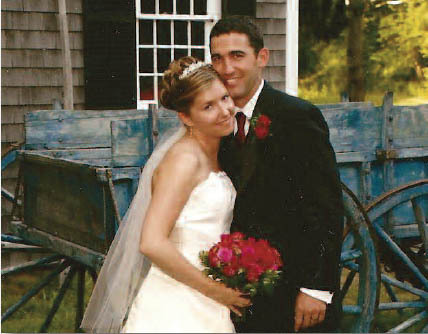 But most of all Kelley Chapel has provided the ideal setting for many memorable weddings on the Cape. The property is owned and maintained by the Historical Society of Old Yarmouth. Its unique location and ambiance lend themselves to celebrations of all sorts. sites, etc. For additional information and to request an appointment to see the Chapel, please telephone 508.362.3652. Or email marietardo@verizon.net. The rental fee is $550 ($50 of which is a refundable security deposit). This includes rehearsal time, preparation, and scheduling the date of your event. To download an informative brochure, just click the button. Click on the photos below to advance a slideshow.